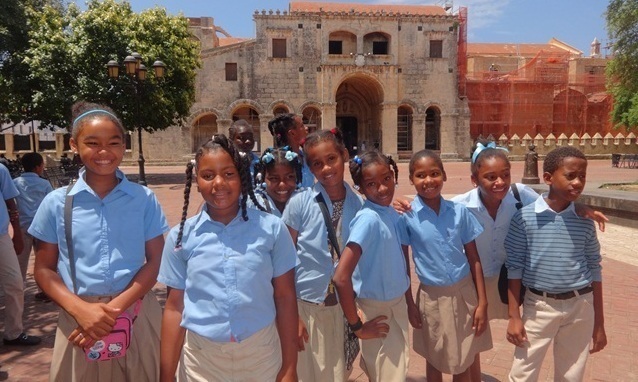 Brandy (second left) attends the Eva Russell School in the Dominican Republic. Life has been difficult for Brandy, her father has been in prison her whole life and as a result she has never known him. Her mother has often been in trouble with the police and for short periods of time has been sent to prison. Brandy has always struggled with the stigma of being their daughter. Brandy receives education and care at the Eva Russell School and it has meant so much to her to have the love, encouragement and support of her sponsors. Their letters of encouragement have given Brandy the knowledge that she is special and loved no matter who her parents are. This year, sadly, one of her sponsors passed away. In her memory, Brandy received a very special gift of a trip from her sponsor’s family. Brandy and a group of her friends went to Santo Domingo, the capital city of the Dominican Republic. They were especially excited as it was their first time visiting the popular city. They saw all the sights in the city and ate at a pizza restaurant overlooking the Caribbean Sea. Brandy’s favourite part of the trip was the beautiful view of the deep blue sea. Fill in our online sponsorship form to sponsor a child like Brandy and make a real difference in their lives.